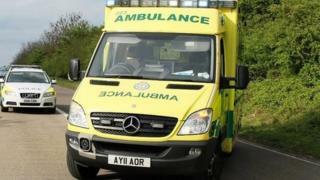 Up to 81 deaths and 120 serious incidents are associated with delays faced by the East of England Ambulance Service Trust, an MP has said. Speaking in the Commons, Liberal Democrat Norman Lamb, a former health minister, said: "This is a service in crisis - patients are at risk." He said more than 200 calls via 999 could not be responded to when they came in as no crews were available. The ambulance service said pressure on its staff was "relentless". It previously said 40 incidents were being reviewed, including the case of a man who was found dead outside his former Suffolk home in freezing conditions. In a series of tweets, it said it received a 999 call every 20 seconds at peak times, and had recruited more than 1,500 frontline staff since 2013/14. North Norfolk MP Mr Lamb said: "They [the ambulance service] appear to have confidence in the leadership of this trust and I fear that they are complacent in their attitude and are not taking seriously enough the number of patient harm incidents that I have referred to. "I have deep concerns about any family member of mine, any constituent or anyone else... who has to rely on this service that they will get a service that will protect them and safeguard them in their hour of need." Mr Lamb said concerns appeared to have been recognised after a "risk summit" was held, adding: "My central plea to the minister is we need an independent governance review." He said he understood the trust had a £2.8m underspend in month nine of the financial year, asking: "How can that be justified?" A seven-point action put together after the risk summit earlier this week includes deploying more staff and using independent ambulances. NHS England said a follow-up meeting to review its progress would be held in a fortnight and that further "enhanced monitoring" would take place.